The historically rich Russian capital of Moscow is an extremely cosmopolitan city. Dotted with famous landmarks like the Kremlin, Lenin’s Mausoleum, and St. Basil’s Cathedral, it oozes a unique architectural style and charm. And it's here that we came across today's makeover story, an apartment which once lay a bare and forlorn space with lots of potential. So the interior architects at Dmitry Barinov used their talent and creativity to transform the empty shell into a gorgeous and visually enticing abode filled with elegant hues, cosy and warm textures and beautiful lights. The sleek and contemporary designs, gleaming surfaces and arty touches of this lavish residence will leave you impressed for sure! 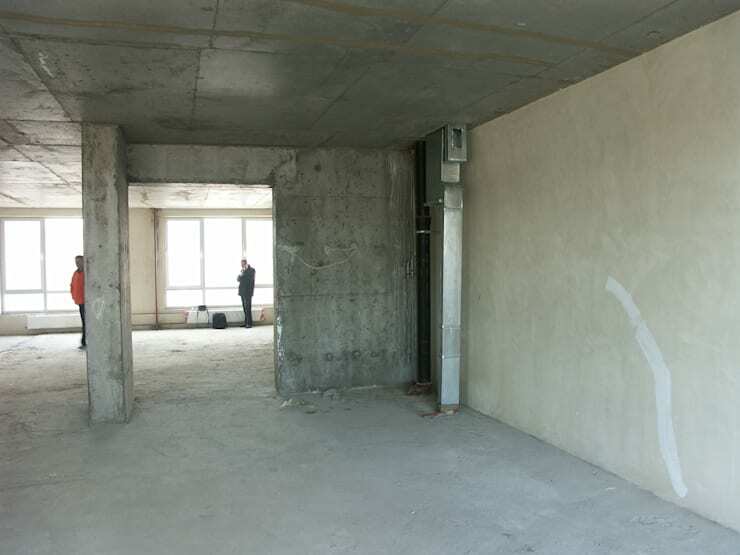 The apartment was initially a barren space with exposed concrete walls and floor. Naturally, it looked cold, unwelcoming and lifeless. But equipped with large sunny windows and oodles of space, it was brimming with the potential to transform into a glamorous modern family home. What an incredible makeover! The main hall of the apartment now dazzles with powerful ceiling lights and a glorious chandelier. Rich tones of wood, creamy white, ochre and grey come together to create an atmosphere replete with elegance and class. 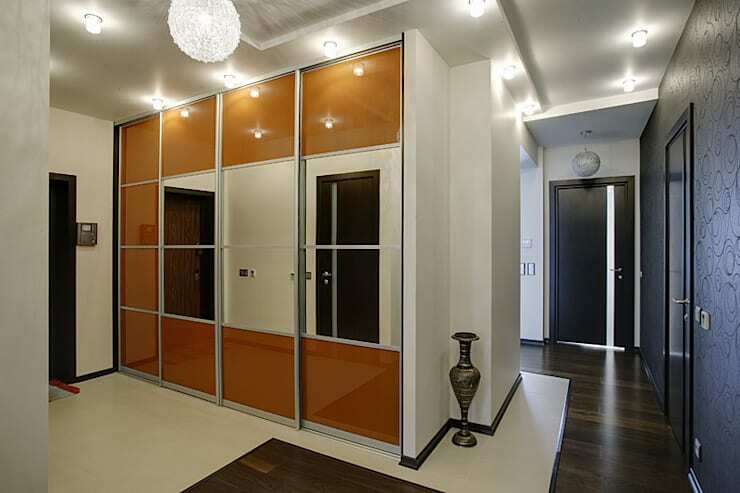 The smart and gleaming closet with mirrored squares beautifully stores coats, umbrellas, hats, shoes and anything else you might need before going outside. A single tall vase stands right next to it to take the style quotient a notch higher. The spacious living area has been integrated artfully with the dining space of this home, and is now decked with various shades of white, cream and grey. Silvery sheer drapes cover the large window and allow an ample influx of sunlight, while the glossy false ceiling gets a glamorous high with the pretty chandelier. A mix of blocks and stripes adorn the plush couches, while trendy wallpaper on the left wall adds spice to the ambiance. The entertainment wall is lined with slim and simple shelves and cabinets to address both aesthetics and functionality. 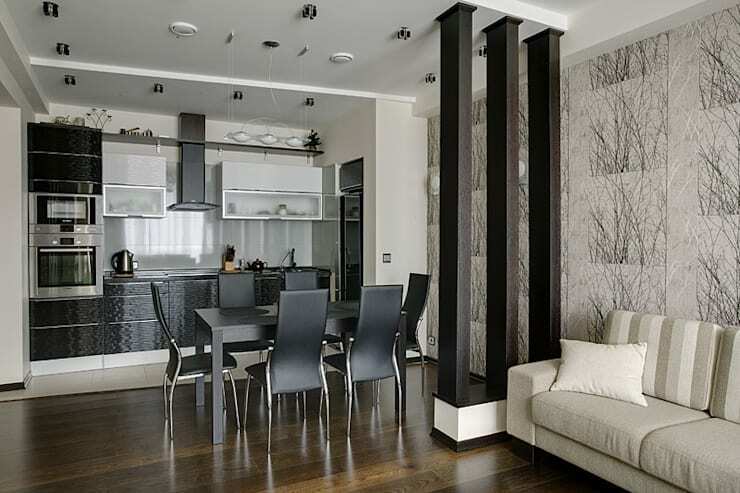 The dark wooden pillars which subtly separate the dining and living areas are a true design inspiration. They complement the warm wooden floor of the kitchen while contrasting the creamy white ceiling simultaneously. The kitchen takes up a single wall, and stands out owing to its rich chocolate-brown textured cabinets. Sleek chrome appliances and some shiny white cabinets add extra pizzazz to the modular space. The dining table is a simple and minimalistic affair and is accompanied by futuristic chairs with gently curving backs. The feature wall behind the bed is a bold red affair with leafy patterns, and takes the amorous atmosphere of the bedroom to a whole new level. The satin patterned bedding, shimmery drapes, exotic chandelier and cosy wooden flooring make for a romantic and dreamy ambiance. The wall facing the bed comes with smart shelves and niches which accommodate the TV, offer storage space, and help in displaying knick-knacks too. Clever concealed lighting accentuates the rich red tone of this wall, which contrasts beautifully with the splashes of creamy white in the room. Impressed by the unbelievable renovation of this once boring apartment? We are too! 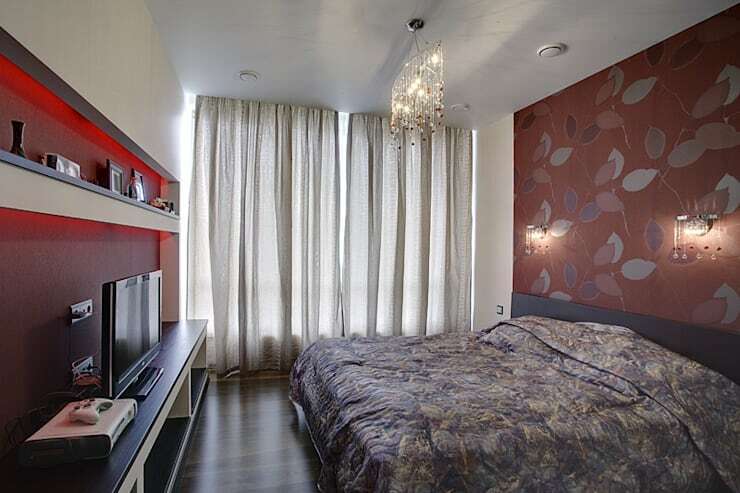 Here’s another before & after story to inspire you further: An Asian apartment's perfect makeover. What do you think of the romantic new bedroom in this lovely home?